Wow, you’re 8 months old! It seems like no time at all since I wrote the first one of these letters to you at 4 months old. Now you’re twice that age! You’re so big now that I struggle to carry you, especially when you’re in your car seat. So, what have you been up to this month? I was sorting out things for a boot fair, when you decided to claim a tiara! What an adorable little Princess you are. You went to see the dentist for the first time! She checked your gums as best she could, but you kept chewing on her finger. What a cheeky monkey! We had to sit in the waiting room for a very long time, but you were very well behaved. 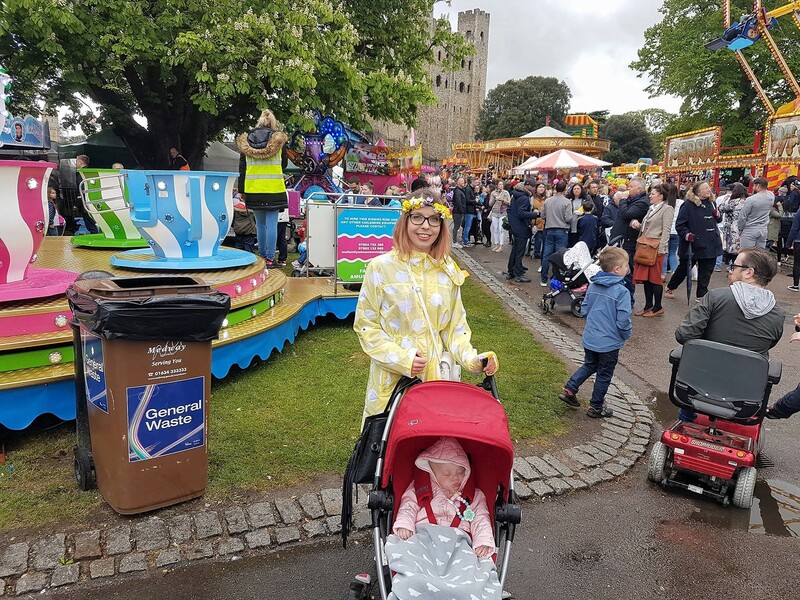 You attended your first Sweeps Festival in Rochester! You were too young to enjoy the festivities this year, but I know you’ll love it in the years to come. This month you joined in with your first protest! 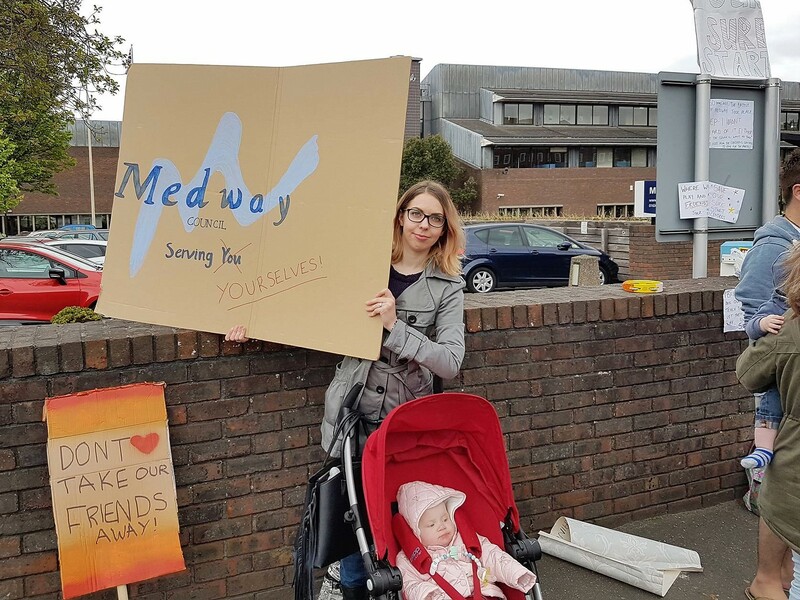 We stood outside Gun Wharf and protested against Medway Council’s closure of 19 Children’s centres. You also attended the cabinet meeting! During this month, you had been out in the big wide world for 32 weeks! This was significant to mummy, because she had had a 4D scan of you at just over 32 weeks. Yes, you finally got your first tooth this month! Only a couple of days later, it was followed by another one next to it. You didn’t like getting them through and became very upset and clingy. You’ll find them very useful when it comes to eating your favourite biscuits, though! Okay, well, it was actually Birmingham. However, we’re from the south, so anything above the M25 is north…right?! We went to the NEC two days in a row. We attended This Morning Live on the first day. I think you liked the guide dogs, and looking around at things in general. I think you enjoyed all the fuss you got in the B&B that evening too. The following day, we went to The Baby Show. Now really, you should have enjoyed this more, as it was for you. However, you were so grumpy all day! You spent the whole journey back being grumpy too. Mummy got a dead arm trying to keep you happy. You did get your first ever balloon that day though! You were enchanted by it at first, watching with glee as you moved it from side to side. Of course it didn’t take long for you to start eating the stick, though. Oh, and we literally chased down Iggle Piggle! You had an Emma’s Diary photo shoot! You were so good, smiling almost all of the time. The pictures of you are gorgeous, just like you. 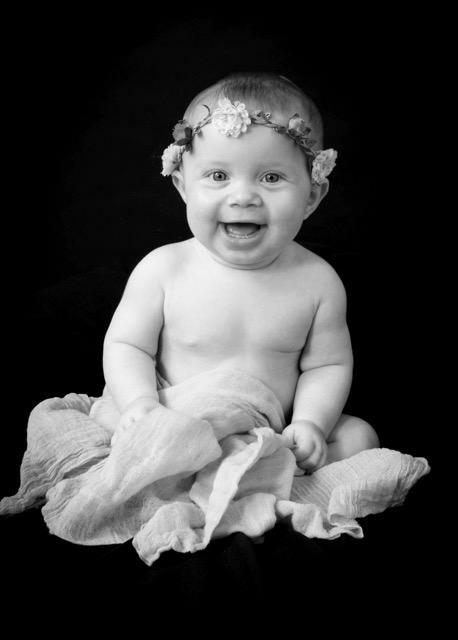 PLEASE TAKE 5 SECONDS TO VOTE FOR AUTUMN FOR BABY OF THE MONTH (MAY 2017) BY CLICKING HERE. You spent much of the month half dragging yourself along/commando crawling, half bunny hopping to move around. However, at around 11pm the evening before you turned 8 months old, you learned to crawl properly! I wonder if it had anything to do with Great Nanny and I crawling around you in circles at her house earlier that evening. We were trying to show you what you needed to do. What a clever girl! Mummy and Daddy certainly need to watch out now, though! Daddy and I are so proud of you, our little darling. We love you so much and love seeing how you grow each month. You are so precious to us.